If you have had dentures for more than 5 years, you probably have noticed that over time, your dentures have become loose. They may slip while talking or move during eating reducing chewing efficiency. The problem is usually more noticeable with the lower denture because you don’t have the palate, like the upper denture, to help support the denture. The tongue is also a destabilizing factor for the lower denture. Poor fitting dentures – can cause more bone loss because the poor fitting denture presses too hard on the ridge and caused it to dissolve away. The most obvious solution to this problem is to make new dentures but this does not address the underlying issue (ie the bone changes) occurring. 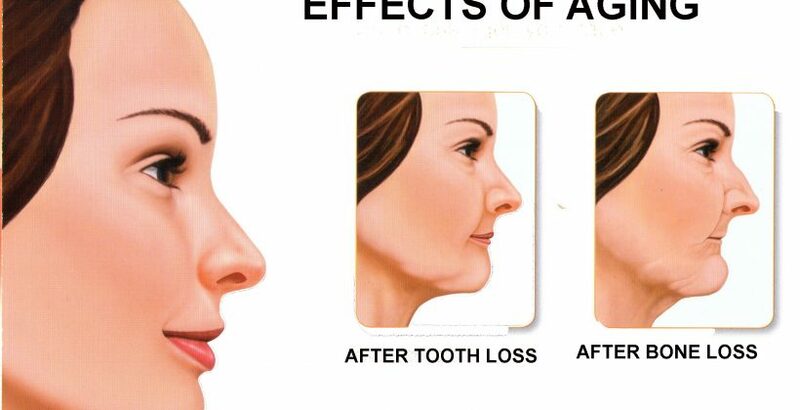 This solution can work but after another 5-7 years you will have more bone loss and so on until there is very little bone left for a denture to sit on. This can have major impacts on our health as we age. If too much bone is lost the chewing efficiency will be compromised impairing their ability to achieve proper nutrition. Most people think of dental implants as a way to make their denture be more stable and move less but there is another more compelling reason to place implants that patients rarely realize. When implants are placed they help greatly to stabilize bone levels and prevent the bone from melting away. The quality of the bone in our mouth varies depending on its location in the mouth. For example, the lower front area usually will have denser bone similar to Oak wood whereas the upper back area more commonly has bone similar to balsa wood. Because the quality of bone in the lower front is good we can usually put anywhere from 2-5 implants in that area that will not only serve to help stabilize the denture but also help to preserve the bone heights. You can see from the image below that the bone height is higher in the area where the teeth are present (follow the red line). This is because the teeth help hold the bone levels stable. Implants have the same effect. 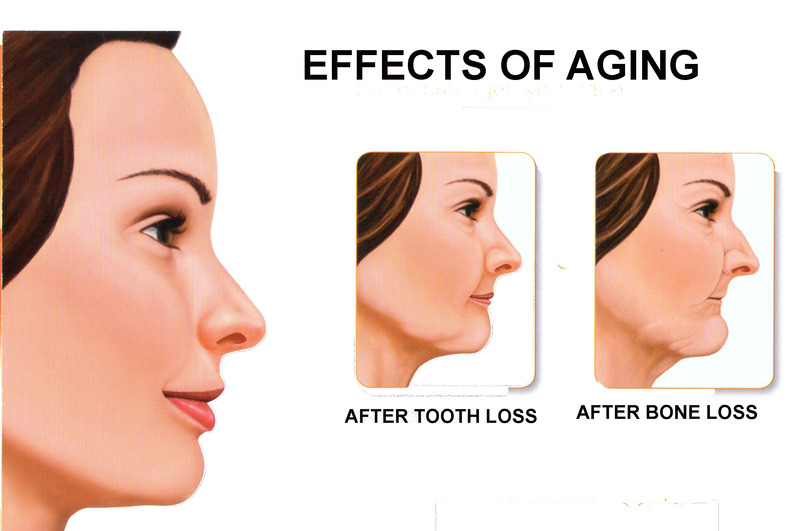 Placing the implants help prevent bone from eroding away!!! In our office we have a 3D scanner. 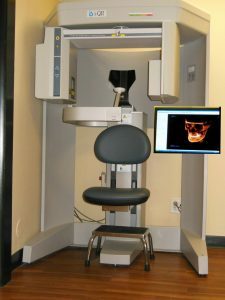 It a specially designed imaging machine (see picture below) that rotates around your head for 8 seconds and gives us a 3 dimensional view of the jaw. In this way we can, get an accurate picture of the quality and quantity of available bone. We then used special digital software to precisely plan and place the implants in the optimal Position.